Sydnie Hall serves for Washington during a non-conference match against Waverly Tuesday, Sept. 4, 2018 at Gardner Park. 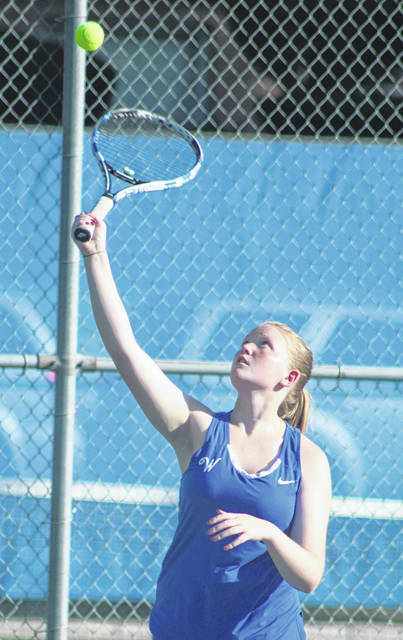 On a hot Tuesday, Sept. 4, the Washington Lady Lion tennis team hosted the Tigers of Waverly High School for a non-conference match at Gardner Park. At first singles, Megan Downing defeated Alli Entler, 6-0, retired. At second singles, Jen Richards beat Emma Bellaw, 6-0, 6-0. At third singles, Brooklyn Foose blanked Desi Swepston, 6-0, 6-0. Sydnie Hall and Beth Wilt won their first doubles match, 6-1, 6-4 over Kayleah Shiland and Kenzie Penrod. Brynne Frederick and Payton Maddux completed the shut out with a 6-0, 6-1 win at second doubles over Kayla Barker and Kaylin Smith. Washington will play at Jackson Tuesday, Sept. 11 at 4:30 p.m.